The Ridgefield School of Dance will present a variety of offerings in this Summer’s Dance program. The series features returning favorites and new programs designed for students of all abilities and ages. “Summer Dance is a great way for students to experience new disciplines, improve dance technique and continue to pursue their love of dance throughout the summer,” said director Alison Brown. Advanced and Intermediate Ballet Intensive (June 11-22) is a ten-day program designed to fine-tune and strengthen serious dancers’ technique allowing them to work on technique in a daily class while including strength and flexibility as an add-on. The schedule takes into account the Ridgefield public schools’ extended year. “I hope the early evening time frame will allow students to enjoy after-school events that often take place at the end of the year,” Brown said. The Young Dancers’ Program (July 10-12, 17-19 and 24-26), offers both Summer and Senior Sprites for three to six year olds and Junior Workshop ages 7 and up. All of the Young Dancers programs may be taken in one, two or three- week commitments. The very popular Sprites program taught by Irene Zimmerman offers a fun class for children who have some dance experience, but is equally well-suited as an introduction to ballet for interested youngsters. 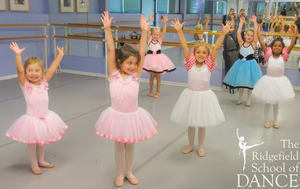 In the Junior Workshop, students can work on ballet, contemporary and other dance disciplines in a relaxed atmosphere. Leading the Junior Workshop this summer is Ridgefield School of Dance and NYU Tisch alum and teacher, Julia Galanski, who uses creative means to guide dancers in creating their own choreography. A new addition to the summer program is the Wednesday Workshop series in August that allow dancers to try a new dance experience each week and may be taken as a package or individually. The timing is good for families who go on vacation in August allowing dancers to take from one to four jazz technique-related sessions. The Wednesday series includes morning and afternoon workshops in jazz-based dance including Lyrical (Aug. 1), Contemporary (Aug. 8), Musical Theatre Dance (Aug. 15), and Jazz (Aug. 22). Classes will include technique and choreography. Ms. Galanski will work with beginning through beginning intermediate dancers ages 7 - 10 for the morning workshop, and will cater to an older group in the afternoons. Afternoon workshops will include a composition unit where dancers will be challenged to explore setting choreography of their own, using different compositional elements and exercises. The Ridgefield School of Dance is at 66 Grove Street. For more information, 203-894-5957 or go to www.theridgefieldschoolofdance.com.